I fully expect to eat some crow. I have made it widely known that I am not a doll person. But....sometimes though, you do what you have to do. A friend is chairing a doll raffle to benefit their local NICU and my local chapter is having a doll raffle as part of our annual auction in the fall. I did take the lazy way out and made two of the same dress. Lots going on around here, I didn't feel like I needed to noodle over two completely different dresses. So I didn't. 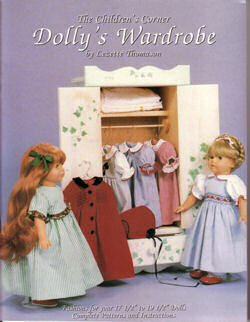 I used Lezette Thomason's book of doll patterns, "Dolly's Wardrobe." There is a lot of comfort in making a pattern that you are familiar with even if it is almost 1/10th the scale. 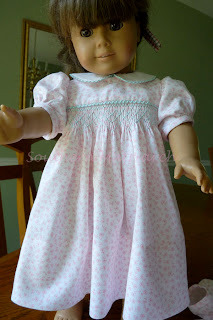 Our Samantha doll has not only been well loved be she also lost weight over the years, so the pattern was quite big on her. I did take up the dress some at the side seams, but not a whole lot. I didn't want it to fit this doll and not fit the next one. I just used the simple smock plate that was included in the book. It took longer to construct one dress than it did to smock two of them. It is smocked with two strands of floss. 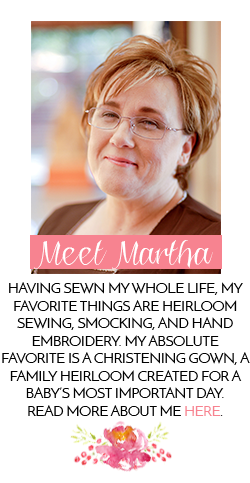 The fabric is Heirloom Imports line pique. 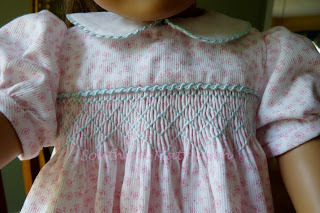 Smocked with aqua and trimmed with aqua whip stitch piping. I have no idea what the collar is done with. White fabric. Isn't that descriptive? It was a hunk I found. All materials are from my stash. So in my mind, free! Here is dress #2. More of the same. I did band the sleeves with binding on both dresses instead of elastic and a ruffle. For me that made the sleeve too big. The sleeves are inserted "in the round" just as I do on bigger girls dresses. I'm not a fan of that seam hanging out the bottom of the sleeve. I am off to pick up our sick kitty. He has been at the vets all weekend. Kidney failure. I think our time with our little old man may be dwindling. This is a picture of him a couple of years ago trying to be nosy. He isn't a very cooperative patient, so I know he will be glad to be home. Adorable dresses and for a great cause. Your cat looks a little like our OLD LADY. Ours is 19 years old now. She's had some kidney issues too, and is, oh, so picky about her food lately. Beautiful little dresses and for such a great cause. Great miniature works of art! I should dig out my girls dolls & make some dresses. 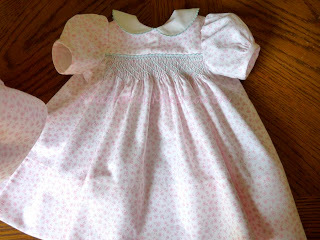 I smocked some baby gowns for the baby doll years ago. your dresses are beautiful! 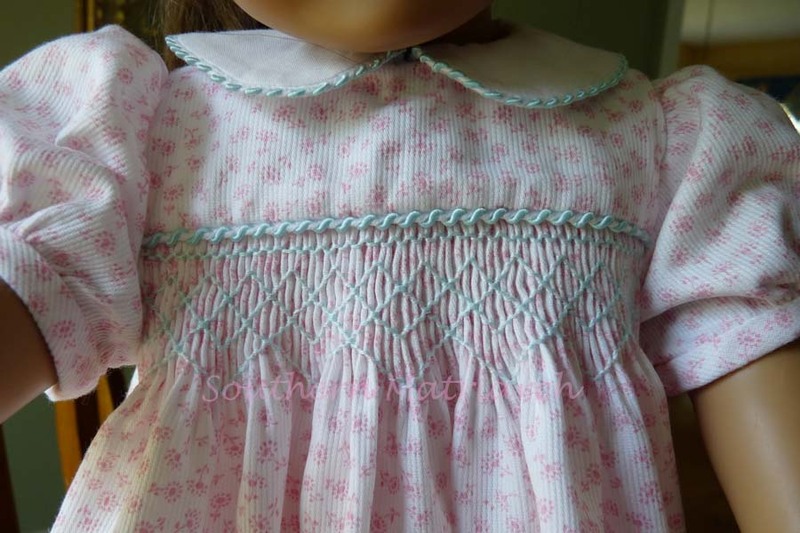 and the smocking perfect! I have this book too, hoping to make kids and dolls matching outfit...only finding my daughter uninterested! Our guild is also doing a doll wardrobe project, and after seeing your dress, I do feel the pressure! I hope your Kitty feels better.